There's an intriguing little store in the France pavilion at EPCOT which offers nearly singly a noteworthy representation of what themed design can do, subtly shifting from one aesthetic to another in a shop which comprises only a few rooms. 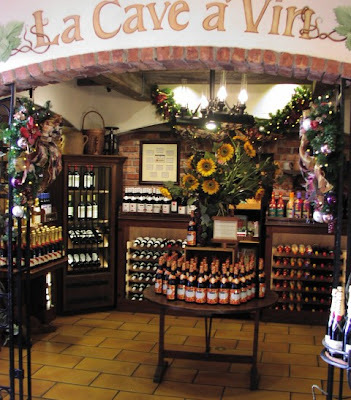 On the Parisian side of the pavilion, near the Palais du Cinema, the store is called Les Vins de France. Around the other side of the pavilion, which is more patterned after the Provinces, another entrance to it is labeled L'Espirit de la Provences. 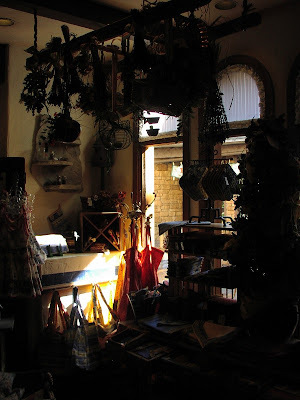 It turns out that both are right, and if the term "fractional architecture" can be used to refer to WED's habit of squishing together geographically diverse architectural styles into a coherent-feeling whole, then this shop is a "fractional interior", one of the first I've found. 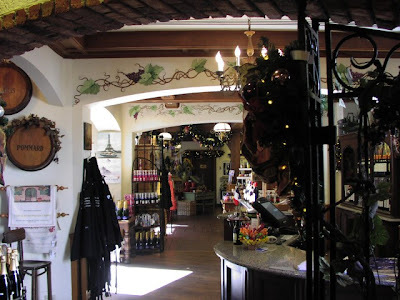 The wine side of the store has a more cosmopolitan flavor, with chandeliers and lots of metal adornments and heavy, curved, plastered arches. There is a wine bar here and the floor is wood grain. Although both sides of the store are cluttered, most of the items contained in this section are held in little metal racks and tables. There is an organized chaos. 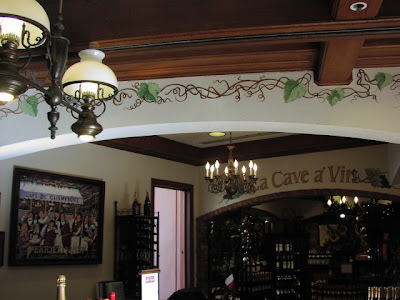 This is the Cave a Vin, and is the only time we still see bricks in the store. 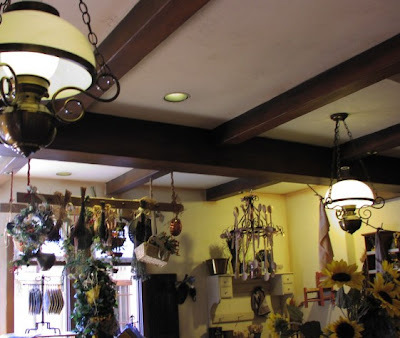 Although there is a slight rural flavor in the light fixtures, the ceiling and floor here, the presentation is more contained and organized than in the Provinces section. Notice that the ceiling around the chandelier by the Parisian entrance is hanging in a plastered white modern alcove, whereas once through this first arch, the walls and decor retain their cosmopolitan atmosphere but the lighting fixture immediately switches to this more provincial double gas lamp (still a relative extravagance). The ceiling immediately acquires timbers, although these timbers are lacquered and detailed. The Provincial section's ceiling, for comparison, with rough-hewn timbers and the less citified single gas lamps. The walls in this section are subtly aged and lack the stenciled adornments of the Parisian section. If the Paris section was artfully cluttered, the Provinces are go for broke. Most of this stuff is for sale, and is so artfully arranged that purchasing something feels like you're disrupting something you shouldn't! This cookbook display is the last of the metal racks. The rest of the store's items are contained in wooden shelves and on tables, all heavily distressed. The original concept of World Showcase, as envisioned for Disneyland, was a clash of styles and cultures placed next to each other haphazardly. The distances placed between the EPCOT Center pavilions improves the concept because by isolating the featured cultures into pockets, the architectural traditions of each individual country can be abstracted into more meaningful patterns through the use of fractional architecture. I highly doubt that there is a term for this practice in Imagineering besides something like "fantasy architecture" but it has been with Disneyland since nearly the very start. There are other remarkable examples of fractional architecture: the Riverbelle Terrace and Disneyland, the Adventureland Veranda here in Orlando, and there are examples of transitional architecture, like the Crystal Palace. 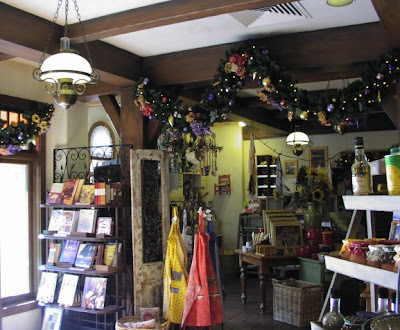 There are many store interiors which change character as you go through them: the Germany pavilion at EPCOT and Hollywood Blvd at MGM-Studios are good example, where every new arch brings a new space. In cinematic terms, as you pass through each portal between stores in that arrangement, there is a "cut", bringing you to a new place. If those stores are like hard cuts, then this little store in France is a slow fade, as one aesthetic tapers out and another takes over. It is a remarkable achievement, and one which is hardly ever noticed ad commented on. Well I am very proud to announce that Passport to Dreams Old & New has finally surpassed 100 posts - and although many other blogs have since passed that mark (especially ones which began publishing around the time I began publishing - late 2006), just about the average length of one of my posts is around a thousand words (I calculated 1500, in the interest of disclosure). Allowing for variance, this means that had I not been writing about Disney Parks I could have had something about the length of Treasure Island by now. Oh well. At something of a loss to commemorate this event with, I decided instead to offer an overview of some of the things I've since offered on this blog in the form of a handy glossary of concepts which I believe are essential to identifying the components of possible designs as well as links back to previous posts where I discuss these concepts, for handy cross-reference. Consider this a snapshot of my work so far on this blog, a tactile record of what I've found so far in my studies. STRIKE THESE WORDS FROM YOUR VOCABULARY! "Magic", in particular, is a very destructive term. It has nearly been copyrighted by Disney to describe the effect of their themed design, but it is not actually a useful term for coming to understand the workings of themed space. "Magic" is a candy-coated term to refer to the effect of the elements I discuss below, but it does not hint at its' function. It may be better replaced with "Receptive State", to imply the willingness of an audience correctly exposed to elements of themed design to accept their reality, or "themed space", to refer to the elements themselves. Never ever ever ever use the word "magic" if you expect to take yourself seriously in discussing Disney design. Doing so necessarily limits the discussion to effects rather than causes, which is Disney's job, not yours. "Story" is the second-biggest lie in the Disney lexicon. The experience of the spectator in a Disney themed environment is not guided by story but by emotion, which flows out of accumulation of the elements of design which comprise a themed space. Since the Eisner corporate/creative takeover of WED in the late 80's the concept of "story" has supplanted the sensible function of "aesthetic" and "experience" in the lexicon. Today, more often than not, Disney will force a "story" onto a themed environment because they are not confidant enough to make their own aesthetic choices; the "story" or "back story" thus functions in the place of artistic integrity. Example: Wilderness Lodge was designed by Peter Dominick, Jr., which WDI then "reclaimed" by inventing a complex back story to "motivate" the project's chief aesthetic choices. But it is the architecture, not the back story, which moves the spectator in this themed space. "Guest" - a Disney hospitality term which was designed to supplant "customer". Design does not have "guests", it has an audience of spectators, who will view it to receive an aesthetic experience. "Imagineered" is a poor replacement for "designed". It creates false prestige around the Disney name, implying that its' designers and artists are somehow performing superhuman feats requiring an invented description. "Transport", "Convince", "Time", "Place" - symptomatic of a public culture which promotes effects over causes. The first two are better referred to an the "themed experience" or "receptive state", the second are best described as aesthetic choices whereas the lesser terms imply a concrete and correct single choice. Themed space is built up of hundreds of aesthetic choices which "stack up" or "stratify" into an aesthetic experience, and there is no right or wrong choice as defined by "story". There is only design, and how it effects the spectator. Correlation - Method of master planning where the relationship of one area to another is strategically and logically devised. Example: flow from Liberty Square through Frontierland at the Magic Kingdom, view of Mt. Prometheus from the various areas of Tokyo Disney Sea. Forced Perspective - Film method of reducing scale in relation to vantage, often exploited to make themed space seem more charming and toylike, or sometimes larger than it really is. Only appropriate for use in situations where a vantage point can be controlled. Shape - Employed by master planners and architects to create meaningful space, usually exterior. Examples: Communicore Center. Scope - Closely related to Forced Perspective, scope is often restricted in themed design for both budgetary and aesthetic reasons. Most common application: structures of foreshortened scope surround one of very large scope, which creates an even greater contrast. Example: Cinderella Castle, see also American Adventure. Negative Space - Literally vacant space, often used in interior themed design to allow darkness to "fill in" areas of minimal importance. Related to the film practice of selective lighting. Example: Mr. Toad's Wild Ride, Space Mountain. Implied Space - Differs from negative space in that while negative space is an area which is supposed to "fade away", implied space "comes forward" through the use of stratification, false portals and other methods. Implied space wants you to think it's present, while negative space wants you to ignore its' presence. Often used to mask stock rooms, offices and other such areas. Implied Space can be created with lights, curtains, props, and even diagetic music and sound effects. Duration - Variable element which is often controlled in interiors through lighting, ride mechanisms, etc. Sometimes Shape has been used to create an experience which may effect Duration. Examples: Main Street USA looks longer entering than leaving due to Shape and Correlation; New Orleans Square demands a slower pace due to its' Stratification and Forced Perspective. All of this, of course, is my own terms for labeling such things, and as a result is my personal vocabulary rather than a universally functional one. But having the vocabulary in place is a huge step forward. While writing this I was reminded of a certain quote by a film critic regarding film watching. His name is Pierre Rissient, and I know very little about him or his writing, but this statement has never left me: "It is not enough to like a film. One must like it for the right reasons." People are likely to get their back up about that as it sounds like snobbery, but one must understand that he does not impose "right reasons" within the statement; his reasons are not the same as your reasons or my reasons. I think it's a true statement about film watching and a lot of other things in life. So much of our culture encourages us to never think while we absorb our entertainment, and it's still true as ever that an unexamined life is not worth living. Although Disney may be hopelessly middlebrow, it doesn't mean that we, the people who are trying to take her seriously, must be. These, above, are my right reasons. I'm not exactly a great or even adequate photographer - I've been using the same old digital camera with the same fixed lens for a decade now, and if one positive thing can be said about it it's that I know the tricks and the limitations of the thing by now and can work within them pretty well. As a compositionalist it can be said that I'm alright, although I am inordinately fond of asymmetrical compositions where the subject is pushed to the thirds of the frame (this was drilled into me in art class and will probably never leave me) and I also love the hoary old trick of sticking objects, leaves, tree branches and other stuff into the foreground of my subjects. I picked it up from The Night of the Hunter and it also comes part and parcel with my photographic style. Which isn't to say that I don't have ideas about photography. Most of my experience leads me to believe that half the art of taking a shot is showing up with the camera; I have thousands of missed opportunities for great photos behind me and only a handful of truly worthwhile ones. Because of this, I believe that there will never be any great photographs taken on an attraction, which makes you view the same things from the same distance in the same time, every time. Photographs of Walt Disney World and Disneyland and Tokyo Disneyland (and on and on) which merely document rather than describe overflow from the internet today; perhaps because it is still a vacation spot for many people does the rule that it only inspires "vacation photographs" still hold true. I think the best sort of Disney park photography captures something tactile about the place, at the right time, in the right place, and the odds are largely random. The Polynesian Village, although it has spread large and no longer goes by that name, is the original "high theme" resort hotel, and still possibly the best. Its' white beaches, tropical planting, traditional bridges (symbols of entering a magic place in American mid-century primitivism; see the Tiki Room), beautiful carvings by Oceanic Arts, and privileged atmosphere are unrivaled by any subsequent Disney property. It is absolutely the biggest thing I will miss when I eventually move on and out of Central Florida. Merry Christmas! Since we're celebrating the Most Material Time of the Year here at Passport to Dreams, I thought I'd offer a special year-end "light break" from our usual through discourse here and start a limited run of articles where you, the appreciative consumer, .... .... Look At My Stuff! My stuff and you looking... a match made on the internet! .... It will be Disney related "stuff", I assure you. 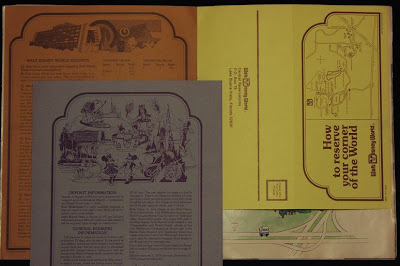 I'm pretty obsessed with Disney ephemera... those brochures, booklets, flyers and maps made to last only fleetingly seem to me to be the greatest window into the day to day realities of a Walt Disney World of 1974, 1984, or 1994. It's the only thing I obsessively collect about Walt Disney World (although I am discriminate) and it is through these paper goods that my understanding of the Walt Disney World of the past has flourished. Today I present you with an array of magazine-type publications printed to promote Walt Disney World ranging in year from 1977 to 1986. The lineage of these magazines, I think, stretches back to a publication called Walt Disney World News which, in the resort's first few years, functioned as the guide to the Vacation Kingdom. Shortly thereafter or concurrent with this publication, a series called Walt Disney World Vacationland began to be produced, related to the West Coast version (Disneyland Vacationland). 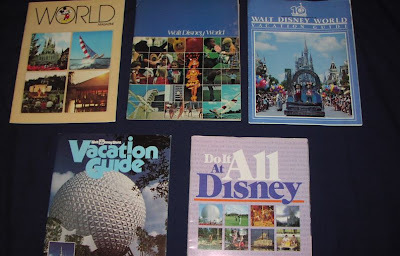 Neither lasted very long because by around 1972 or 1973 we start finding GAF "Your Guide to Walt Disney World" brochures around the resort and by the publication of that 1977 "World Magazine" up in the left above, Vacationland was long gone in Florida. Vacationland was a "real" magazine, in the sense that it had content and articles, and even advertisements for other area attractions, and was started for Disneyland by Marty Sklar as an outgrowth of a novelty Main Street newspaper he started for Walt Disney in 1955. The Walt Disney World Vacationlands, beautiful and much rarer than the Disneyland versions, contain probably some of the best little seen pictures and information about the resort's formative years. "World Magazine" began and perhaps lasted only through 1977, as the version I have is labeled as issue 2 of volume 1 and appears to be intended for the July - December timeframe as it promotes holiday Disney theatrical releases in its' last few pages. It is much less of a magazine than a guide to Walt Disney World, with beautiful descriptions of each location and service and with an interior layout both dynamic and classy as Disney only could achieve in the 1970's. 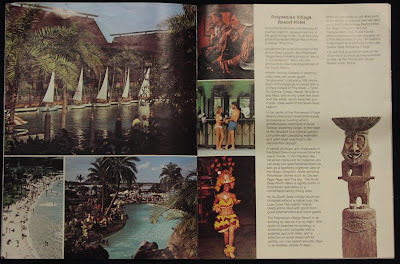 This two page spread for the Polynesian is only just the best in the magazine, but the call was very difficult to make. By 1978, "World Magazine" had been replaced by the generic "Walt Disney World" publication, but the contents were largely the same. Flash forward to 1981 and the Tencennial "Vacation Guide", and the nomenclature had been ironed out into something sensible, which more or less would stick. 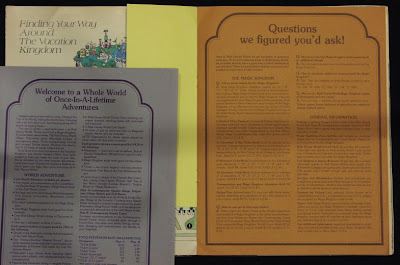 In the center of all the books (it's missing in the World Magazine one but the space for it is clearly there) is a number of paper inserts detailing the very fine details of the resort operations for guests, such as dress codes and phone numbers. This is where the resort of the past truly comes to life for me, not in pictures or video but raw information about services, dining locations, and so on. 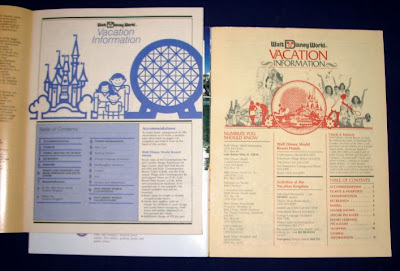 Below, two such information sections for the 1981 and 1984 Vacation Guides. 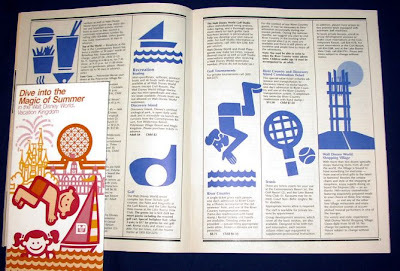 The graphic design of the 1984 Vacation Guide reminds me strongly of the design for this 1983 summer season brochure. 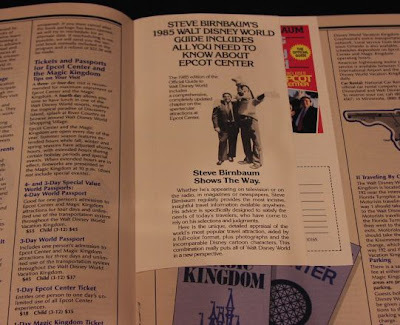 Also inside the 1984 guide: a mail-order form for the 1985 Steve Birnbaum Walt Disney World guide, which was either in or very near it's first year. Once we get into the Eisner era with the "Do It All At Disney!" book, things become noticeably more pedantic. Full page, oversaturated, badly clustered groupings of photos become the norm and the evocative text is gone. I'd offer examples if anything in the book were worth sharing, but anyone who remembers how bad Disney's graphic design got in the early 90's ("So Much More Than Ever Before!") doesn't need any more clues. By 1989, these full color magazines were gone, replaced by the nicely designed but more basic matte paper vacation guides. Today you're lucky if you get anything of substance at all. The peak of this sort of thing was in the 1970's, and the absolute best, most complete one of these I have is the 1978 blue cover, with all these beautiful paper inserts in the center. I certainly feel better having a yellow room reservation slip from 1978... I could've stayed in the Polynesian for just $60 a night!